In 1765, North Carolinians joined their fellow American colonists in protesting the Stamp Act, passed by Parliament that year, which taxed various kinds of public papers. Protesters, arguing that the tax was illegal without the consent of colonial assemblies, marched to the home of the tax collector and forced him to resign. On Saturday, November 16th, 1765, Dr. William Houston, a respected resident of Duplin County, arrived in Wilmington, North Carolina for a short visit. Houston had recently been appointed -- to his great surprise, since he had not sought the position -- distributor of stamps for the colony of North Carolina under a new revenue law enacted by the Parliament of Great Britain. Houston may have heard that the new tax was unpopular among his fellow colonists, but he quickly learned that the citizens of Wilmington were particularly upset about it. A crowd of three or four hundred people accompanied by drums and flags appeared at his inn and escorted Houston to the courthouse where, in the presence of Wilmington's mayor and several aldermen, he was told that he would have to resign his position as stamp distributor. Under the circumstances, and not having wanted the job in the first place, Dr. Houston resigned on the spot. This made him the crowd's hero, and Houston was carried in an armchair back to his inn and toasted by his admirers with "the best Liquors to be had." More toasting followed around a bonfire that night as opponents of the new tax cheered themselves and their noble endeavor. The assault on Dr. Houston, while no one was harmed and the whole affair was more or less good-natured, was a symptom of a very real and serious division between Great Britain and her American colonies, a division which would soon lead to revolution. For much of their early history the British colonies in North America had been treated with what has been called benign neglect. Great Britain regulated the colonies' external trade through a series of navigation acts, but colonial assemblies took over responsibility for their internal affairs, including levying taxes and appropriating money. This changed as a result of the Seven Years War (1756–1763), which Americans knew as the French and Indian War. In North America British and colonial troops fought the French based in Canada, but Great Britain was also engaged in Europe and India in what Winston Churchill called "the first world war." Britain made many important gains during the war but at a great cost, and emerged from the conflict determined to bring its colonies under firmer control and raise some of the revenue necessary to support the new empire from colonial sources. As a part of this new policy Britain decided to station a permanent army in America to provide for colonial defense and pay for that army with funds raised in the colonies themselves. To this end Parliament, in March 1765, required that Americans pay a small tax on certain kinds of public papers, such as newspapers, pamphlets, insurance policies, ship's papers, playing cards, and legal papers. To show that the tax had been paid, a stamp would be affixed to the paper. To the British this seemed reasonable and fair. To many American colonists, however, it violated the custom that direct taxes be levied only by colonial assemblies and the principle that Englishmen could only be taxed by a body in which they were represented. First resistance to the Stamp Act came in Boston, where the property of the stamp distributor was burned and the home of the colonial governor attacked. In response to an invitation from the legislature of Massachusetts, nine colonies sent delegates to the Stamp Act Congress in October 1765. No delegates from North Carolina attended the Congress, but feeling in the colony, especially in the coastal area, was very much opposed to the tax. Governor William Tryon worked hard to convince North Carolinians to accept the tax, but when HMS Diligence arrived on November 28th bringing the tax stamps, the colonists refused to let them be brought ashore. In mid-January two ships were seized by the British navy in the Cape Fear River for sailing with unstamped papers. A thousand armed colonists forced the release of the ships and their crews. Governor Tryon discovered that he could not rely on magistrates and other law enforcement officials to suppress the disorder since so many of them had joined the protesters. The tension was finally eased by the repeal of the Stamp Act in March 1766. Life in colonial North Carolina returned to normal, but the Stamp Act Crisis had revealed serious, on-going problems in the relationship between Great Britain and the American colonies. Harry McKown, "November 1765: The Stamp Act Crisis in North Carolina," This Month in North Carolina History, November 2006. 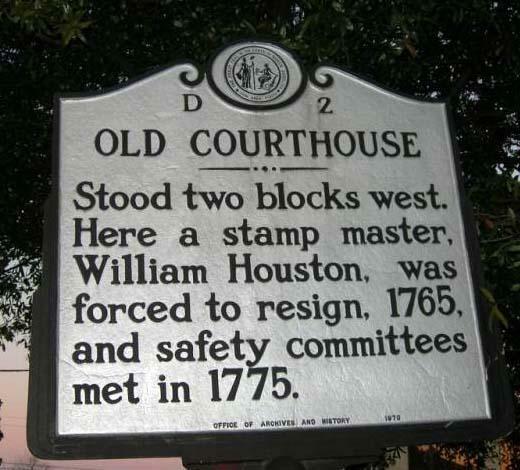 Site of the resignation of the colonial tax collector in 1765, Wilmington, N.C.